The peace dividend is in jeopardy. 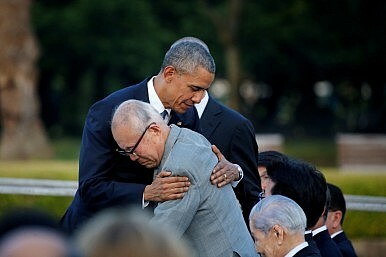 In one of the most touching moments in recent political history, U.S. President Barack Obama hugged a Hiroshima survivor while visiting the site bombed by American forces 70 years ago. It is difficult to imagine such sincere behavior from most other politicians, especially one particular American presidential candidate. Given the economic, social, and political strife endured by millions of people, the world is in deep need of empathy from its leaders. Yet tenderness and sensitivity are endangered qualities, particularly in this era of suspicion, uncertainty, and political bravado. A sweeping tide of protectionism and alarmism is flooding governments with political mandates to boost defense spending. The peace dividend is in severe jeopardy, and as usual society’s vulnerable will suffer the most. Earlier this year, Obama stated that this is the most peaceful era in human history. By some measures, this claim is disputable. For example, between 2014 and 2015, countries in the Asia-Pacific region increased military spending by an average of 5.4 percent and those in Central Europe by 13 percent. Nevertheless, global military power remains top-heavy. In 2015, the United States again dominated the worldwide share of military spending at 36 percent; this is a higher percentage than the next seven countries combined. Asian countries with the largest share were China (13 percent), India (3.1 percent), Japan (2.4 percent), and South Korea (2.2 percent). China, India, Pakistan, Indonesia, Australia, Myanmar, the Philippines, and Malaysia each boosted their military budgets by double-digit percentages year on year. While these expenditures do little to unseat American military hegemony, they are evidence of an emerging 21st century arms race. Such expenditures are a boon for private military contractors, and the arms industry appears to be on the verge of another golden era. The global economy has been sluggish to recover from the 2008 recession, and stubbornly low commodities prices are suffocating economic growth in resource-rich economies. Compensating for these conditions with military spending is tempting; this strategy boosts GDP, stabilizes employment, and generates private sector returns. Global security concerns such as terrorism and territorial encroachment are justifying this arms race in the eyes of lawmakers and the public, and many will prosper as a result. Finally, ideas can be blamed for additional military spending – in particular, extremist ideologies rooted in ancient traditions and beliefs. According to a recent Salon.com article, religiosity “continues to play its part in promoting in-group out-group thinking, which casts the difference between people in terms of eternal rewards and punishments.” Of all factors driving the 21st century arms race, ideas may be the most discouraging because they are frequently bereft of logic. For manipulative governments and insurgent movements, ideas serve as identity markers and rallying points. For the pious, they can offer comfort in a turbulent world and furnish seemingly plausible explanations for injustice and suffering. The lure of ideas is indisputable, evident in persistent and passionately fought conflicts around the world – the Philippines, Caucasus, Palestine, and Kashmir, among others. Sectarian violence in Iraq and Syria, and the spillover effects of migration, are inflaming divisive rhetoric from Europe to North America. In addition to territories, industries, and ideas, perhaps one explanation supersedes all: the selfish pursuit of political legitimacy. Public perceptions about national vulnerability – legitimate or otherwise – are being exploited by opportunistic politicians, particularly in so-called “pop-nat” (populist-nationalist) governments. Among the world’s three largest superpowers, Russia and China are both ruled by “strongmen” who have tightened their grip on power and squelched the voice of civil society. Further, it is a significant historical moment in the United States when a blustery political amateur with an authoritarian fetish enjoys passionate and even violent support. Such bravado is often accompanied by calls for military strength, a “red meat” issue for many voters. These trends must be unsettling to people with knowledge of 20th century history. Authoritarian tendencies are emerging in various ways throughout the world. The Philippines recently experienced what some argue is authoritarian drift, while strongmen governments rule Turkey, Kazakhstan, and Venezuela, and political environments in Poland and parts of Central and Eastern Europe are said to be trending towards the same. India’s Narendra Modi has been accused of nationalist-authoritarian tactics, in particular the suppression of free speech. A narrow miss for the troubling revival of European authoritarianism came in Austria’s 2016 elections, in which far-right populism lost by only 1 percent. Refreshing exceptions to this trend include the elections of Canadian Prime Minister Justin Trudeau and Taiwanese President Tsai Ing-wen, progressives both known for mild dispositions and a concern for human rights. According to a Hunter College professor, “authoritarianism is on the rise nearly everywhere.” The connection between militarization and an emerging brand of authoritarian rhetorical alarmism is plausible, so the gathering arms race figures to continue. Unfortunately, this compels governments to indulge in outlandish and often wasteful spending, consuming budgetary resources that could otherwise be applied to pressing social challenges such as public health, education, and poverty alleviation. Indeed, of the world’s 16 countries that spent at least 4 percent of GDP on their militaries, only three are among the top-50 of the UN’s Human Development Index (HDI): Saudi Arabia, UAE, and Bahrain. Illiberal nationalism, like the McDonald’s meal Donald Trump recently consumed to celebrate his nomination, may satiate hunger in the short run but eventually has harmful effects. 20th century history has one well studied example of nationalist-authoritarianism, and it did not end well. Is the world doomed for a repeat?